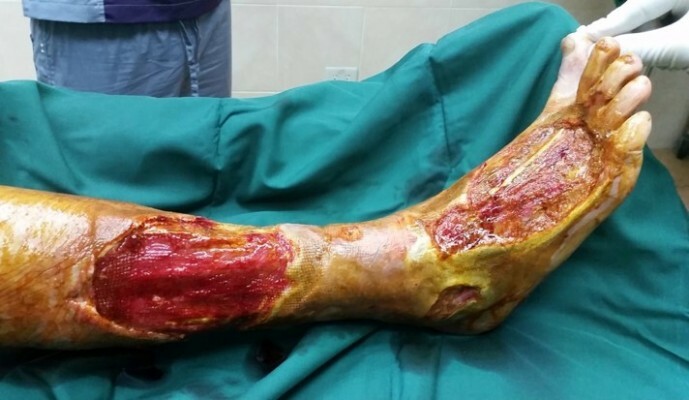 Introduction: Two cases of large, infected, nonresponding wounds in diabetic patients successfully treated with the combined use of a three-layer, hydrophilic polyurethane foam dressing with SMARTPORE Technology™ and povidone-iodine formulations are reported. Objective was to provide optimized local wound bed preparation to prepare the wound bed for skin grafting. Presentation of cases: In case 1, a 76-year-old male presented with a 4-day history of bullae formation on the right leg due to necrotizing fasciitis. In case 2, a 65-year-old woman with a chronic right foot ulcer sought medical treatment. Main observations: In both cases, the combined use of the polyurethane foam dressing and the selective use of various povidone-iodine formulations provided good exudate absorption, lesser pain during dressing changes, infection control and reduced inflammation, thus enabling the successful management of chronic problem wounds in adult diabetic patients. Conclusion: These cases may further provide clinical data to show that this new polyurethane foam and povidone-iodine products can readily be used together and can be seen as compatible.